It takes care of your pet when you are not there. Replenishes your pet’s food and water. It gives you the ability to see your pet at any moment. 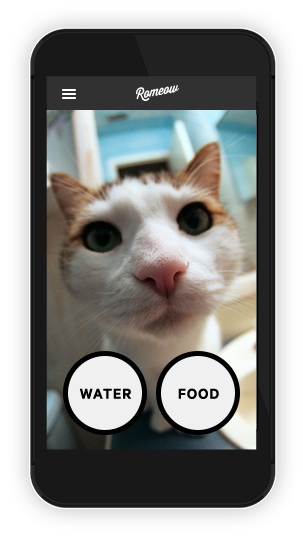 You can check on your pet with the use of a webcam and a smartphone. It brings unique Italian design into your home. With its variety of finishes, it will seamlessly fit into the style of your home. Don’t we all love to spend time and play with our pets? Unfortunately, our extremely busy lives do not always allow us to do so. Sometimes our presence is crucial and sometimes we can use technology to be there for our pets. 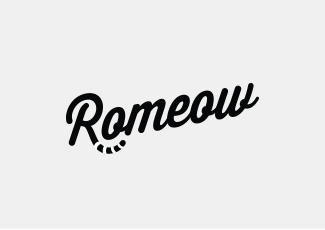 Romeow is an innovative system that allows you to remotely participate in your pet’s life by using a simple smartphone application. 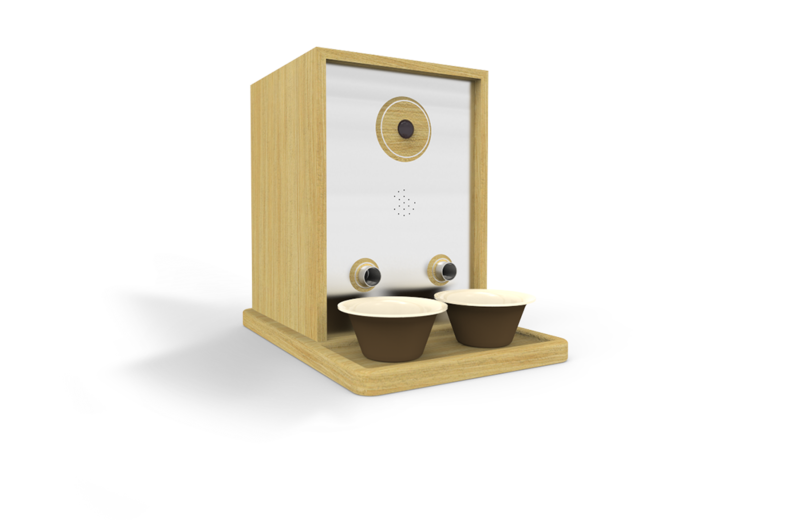 This application not only lets you dispense food for your pets but also create a complete feeding schedule. Now you do not have to worry about staying late at work or not making home on time to feed your little friend. Just press the button on your phone and the food is served. Romeow feeding system allows you to use an integrated webcam to check whether your pet needs the bowls refilled. Just press the button “fill” and the food and water bowl are automatically replenished. 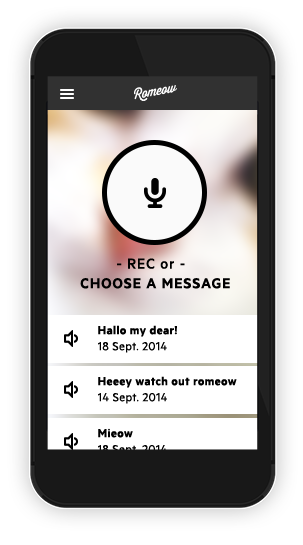 Record function allows you to send a voice message or command to your pet through the speaker installed on the dispenser. 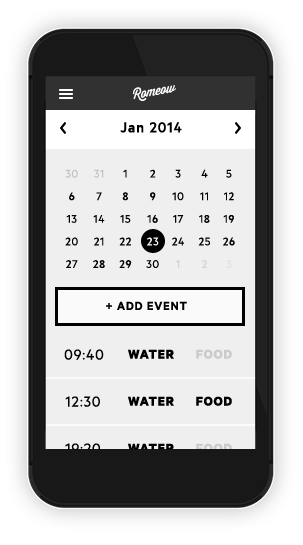 Calendar function allows you to schedule date and time for the food and water to be dispensed. Moreover, you can choose a particular quantity of food you want to be dispensed. The internal containers are made from food-grade plastic to preserve the quality of food and water. Computer and electronics of the device are fully protected and cannot be accessed by pets. The speaker installed on the device allows you to call your pet when it’s time for food. The wood paneling is modern and stylish and will fit into any kitchen. You can also add a scratching post to one of the device’s sides and save your sofa from nails and teeth of your little friend. 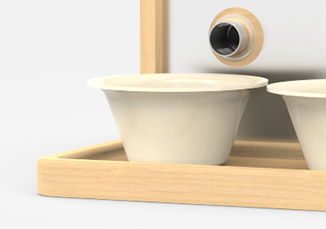 The bowls are set in a groove so that they remain in the correct position both for refilling and for feeding. In particular, this position does not allow pets to move the bowls while they are eating. The minimalist profile and retro style of ROMEOW make it an everyday object that can fit into the most diverse environments with an unmistakable elegance. Each piece comes assembled by technicians and artisans, making every ROMEOW unique, just like your four-legged friend. The design is discreet, clean, and refined, just like the traditional Italian design of the 50's and 60's that became famous around the world. 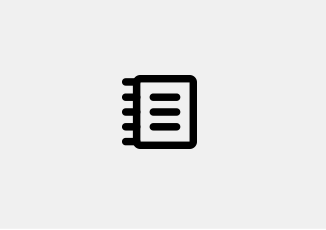 Visitando questo sito accetti l'utilizzo dei cookie che ci permettono di fornirti un'ottima esperienza utente.